The Cabinetmaker’s Guides book series, the Best of The Scale Cabinetmaker book series and The Cabinetmaker’s Guide Journals are available for ordering here. Just go to “Our Store” using the link in the menu even though it does say under construction. These files are quite large and will take a good deal of time to download so be prepared to wait. We (using the imperial here) will help with any problems that may arise as quickly as possible, just let us know at orders@thescalecabinetmaker.com. Our new system allows you to place your order online and then send in a check if you do not wish to use PayPal or credit card for payment. Just place your order uring the Add to cart buttons and when ready to pay, signify that you wish to pay by check. Once your check has been received and processed, you will receive an email with your download instructions. These include: Back Issues of The Scale Cabinetmaker (limited quantities), The Best of The Scale Cabinetmaker Series, and The Cabinetmaker’s Guide Series. Each issue of The Scale Cabinetmaker is packed with articles designed to teach you the tools and techniques you need to tackle your own projects. While we provide specific projects, their purpose is to teach you new skills and hone skills you may already have. From working with brass to perfecting your lathe techniques; from creating room boxes to learning advanced joinery to creating the perfect finish. Learn how to make your own scale dowels using a drill gauge from Jim Jedlicka, the TSC tool editor (and retired NASA engineer). All in one issue and all for only $6.00. Not a bad deal. 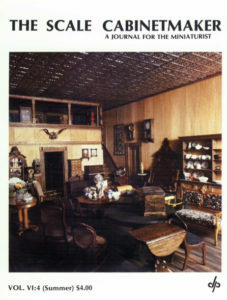 You can buy The Scale Cabinetmaker by the issue ($6.00 per issue as a pdf download) or by the year ($24.00 for 4 issues on cd-rom of which we still have a few available). For information on cd-rom ordering write us. If you would like to know more about the TSC contributors, check out our author’s index.